As of Wednesday, August 24, 2016, Slackware ARM is out of retirement and ready to power your modern ARM devices. The Slackware ARM maintainer has made the decision to pick up development again and go ahead with a hard float port. It was announced three months ago that a hard float port was in the works, and today it’s powering my Raspberry Pi 2. Unfortunately the hard float release has been mostly ignored by the mainstream teach sites, but it’s definitely on top of my list. Get up to date with the latest development at arm.slackware.com. I’ve only had a few days of experience with the Slackware ARM -current hard float port, but it has delivered on everything I’ve come to expect from Slackware. 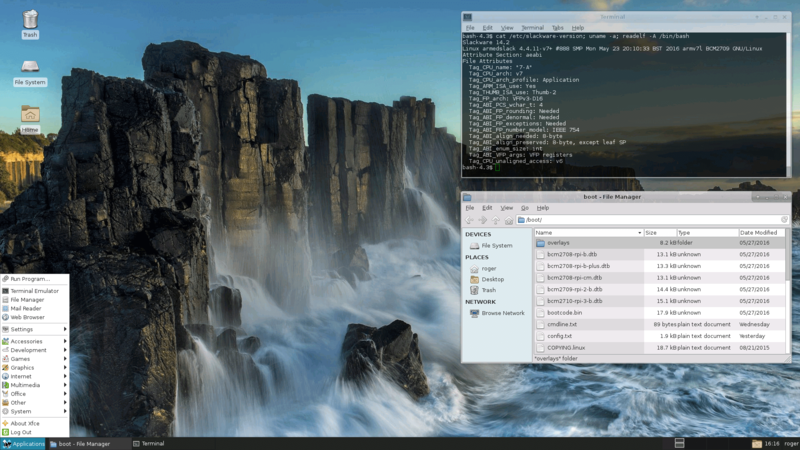 I’m currently running Xfce on the RPi2 and performance has been pretty impressive. Not even Firefox was able to grind the system to a halt the way it used to. Anyhow, compiling software on the RPi2 is still painful (think WebKit), but installing and upgrading stock packages feels much snappier. I used the Slackware miniroot + raspbian boot installation method. Instructions are available at docs.slackware.com. Post installation, you might find that you need the libidn package, and you probably also want gnupg for slackpg before installing the package series. Get the additional packages by searching PACKAGES.TXT. Watch a quick demo of the Slackware ARM -current hard float port on the RPi2 here. So you've patiently been waiting for the next Slackware release but eventually you're considering making the move to Slackware-current. So what exactly is Slackware-current and what would be the pros and cons of switching from stable to -current.